The new Husky air tool line is built to industrial standards for the professional user providing more power, less noise and longer life. This new Palm Sander features low weight housing with rubberized over mould for comfort. The isolated oil free motor design reduces vibration by up to 50% over conventional palm sanders, and allows use of the tool without lubrication. The internal silencing greatly reduces tool noise and the built-in regulator allows you to match the speed of the tool to the job. Designed for surface preparation and final finish sanding of metals, plastics, composites, fillers and glass fibre used on autos and recreational vehicles. The orbital action provides the smoothest swirl free finish possible; this design tool is favoured for auto repair shops and high volume furniture/wood product manufacturers where the finest surface finishes are required. The Campbell Hausfeld air rivet gun (CL153900AV) is ideal for automotive and construction assembly work. The hardened steel jaws set rivets in steel up to 3/16-inch thick. This air rivet gun produces 2,000 pounds of pull to handle tough jobs. Air Consumption Avg. : 0.2 SCFM, Air Consumption Cont. : 1.1 SCFM, Air Inlet: 1/4 in. NPT. Finish your projects faster and easier with Campbell Hausfeld - The Air Power Expert. The Campbell Hausfeld get stuff done air Cut-Off tool (XT200000) helps you tackle projects with ease. The = HP motor powers the 3 inch cutting disc through nearly anything - including plastic, fibreglass, composite materials, sheet metal, angle iron, metal tubing and more. The XT200000 also features a 360 degree rotating guard and secondary trigger-latch for user safety. The multiple air flow adjustments makes control easy all you need is a Quick turn of a screwdriver. This air Cut-Off tool boasts a lightweight composite design (1.6 lbs. ), and a rubberized, comfort grip for a user friendly experience. With a free speed RPM of 20, 000 the XT200000 will get stuff done in a Quick and efficient matter. Average air consumption of 4.3 CFM @ 90 PSI. Maximum pressure of 90 PSI. Air inlet size of < inch. Minimum hose size of 3/8 inch. An air compressor with a tank capacity of at least 30 gallons is recommended. Get stuff done faster and easier with Campbell Hausfeld the air power expert. With the great Powermate air shear all those unfinished projects can be taken care of. Handling of this item is made easy with its lightweight aluminum housing and a pistol grip for added comfort. Heavy duty cutting shear is reliable and long lasting. Easily cut straight lines in metal, plastic, aluminum and tin. 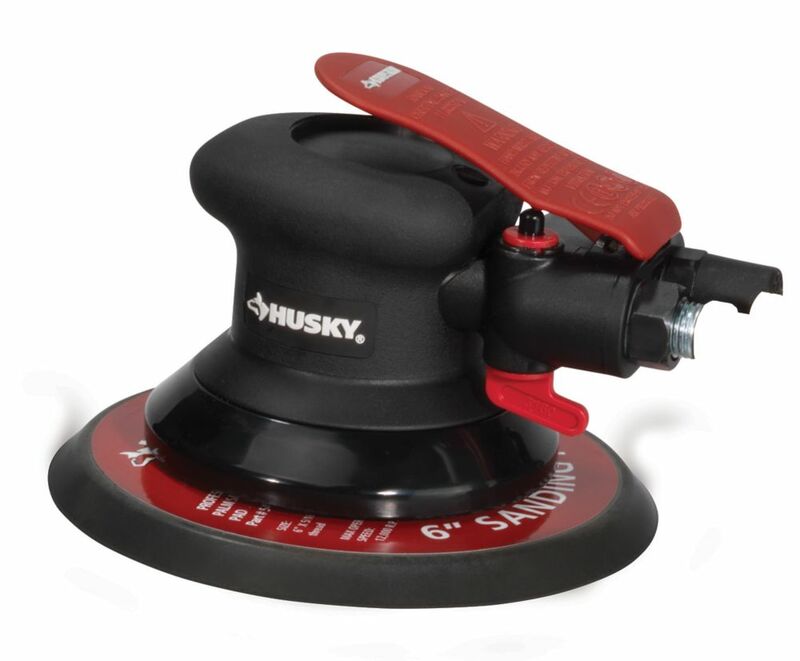 6 In Palm Sander The new Husky air tool line is built to industrial standards for the professional user providing more power, less noise and longer life. This new Palm Sander features low weight housing with rubberized over mould for comfort. The isolated oil free motor design reduces vibration by up to 50% over conventional palm sanders, and allows use of the tool without lubrication. The internal silencing greatly reduces tool noise and the built-in regulator allows you to match the speed of the tool to the job. Designed for surface preparation and final finish sanding of metals, plastics, composites, fillers and glass fibre used on autos and recreational vehicles. The orbital action provides the smoothest swirl free finish possible; this design tool is favoured for auto repair shops and high volume furniture/wood product manufacturers where the finest surface finishes are required. 6 In Palm Sander is rated 5.0 out of 5 by 1. Rated 5 out of 5 by Radrod from high quality Rally nice tool, great for auto body work. Used it for carpentry work as well. Would recommend something bigger than a 8gal 2hp compressor though. Hello, What is the orbit diameter?